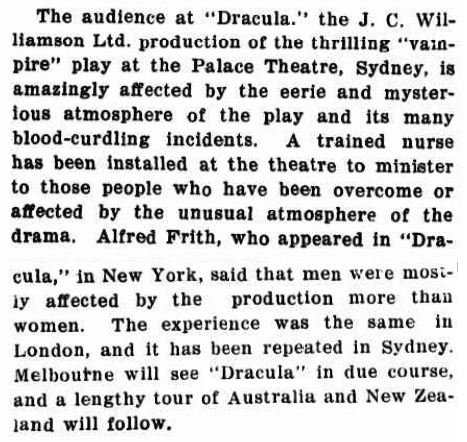 To-night, at the Palace Theatre, “Dracula” will be performed for the first time in Australia. 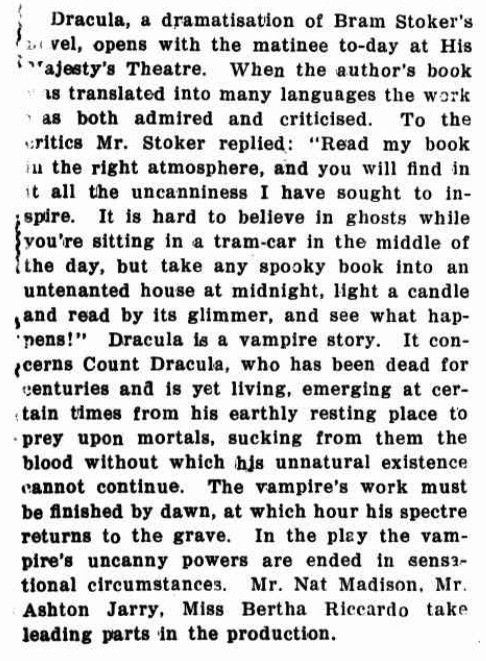 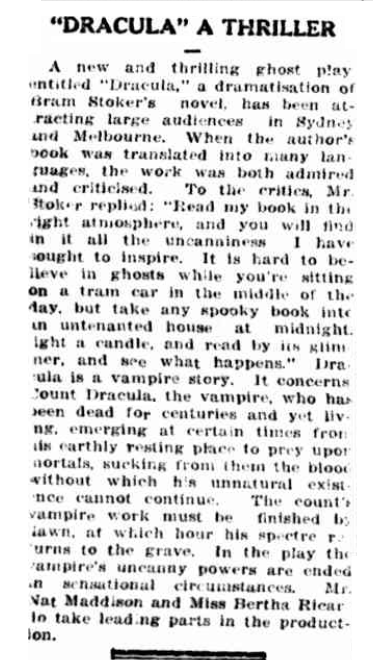 Bram Stoker’s story “Dracula”” is described as particularly weird. 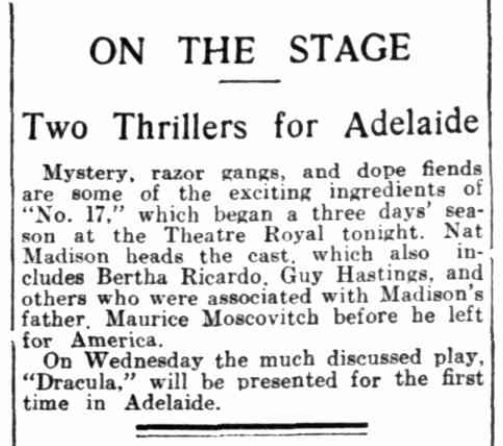 Mr. Ashton Jarry will play the title-role, Mr. Nat Madison will appear as Renfield. 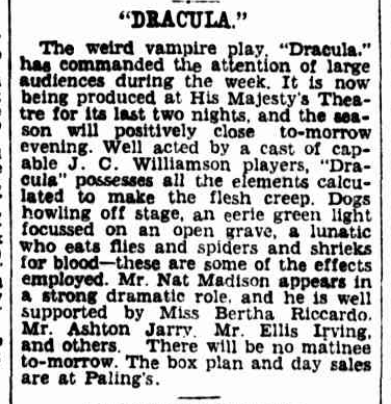 The first matinee of “Dracula” will be given on Monday..
Large audiences find much to interest them in “Dracula” at the Palace Theatre. 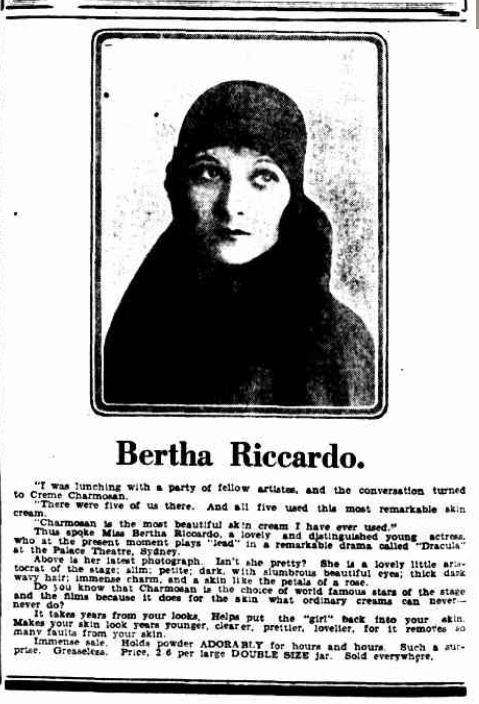 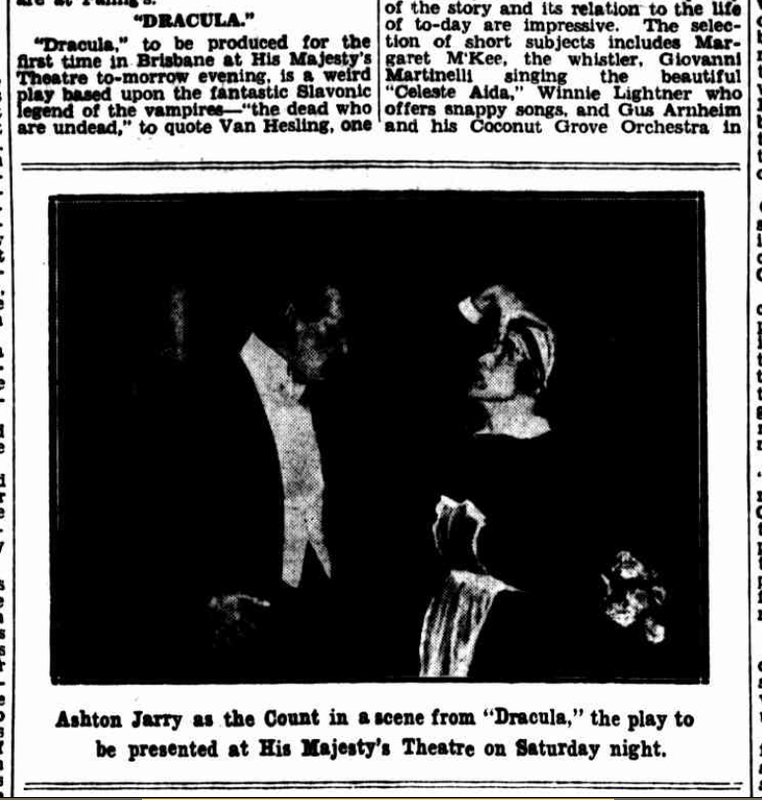 Mr. Ashton Jarry appears in the title-role, Miss Bertha Riccardo as Mina Seward, and Mr. Nat Madison as Renfield. 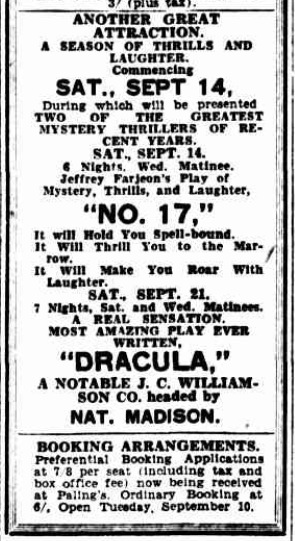 A matinee to-day is announced. 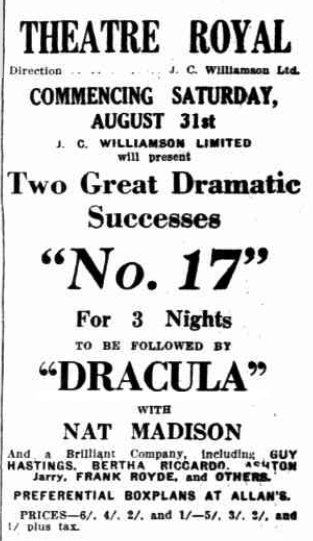 “Dracula” continues to draw large houses at the Palace Theatre. 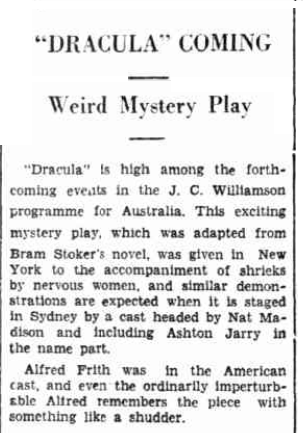 The title-role is played by Mr. Ashton Jarry and Miss Bertha Riccardo and Mr. Nat Madison are also prominent. 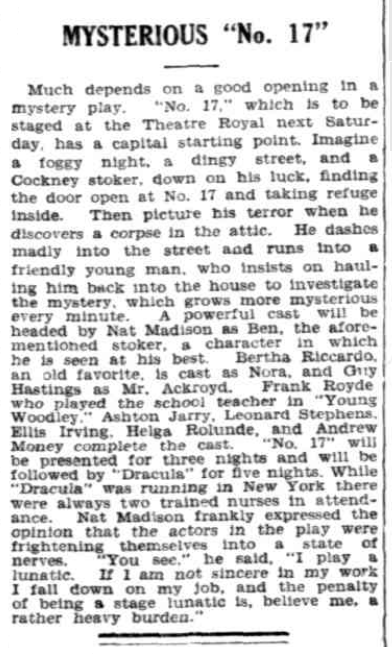 There will be a matinee to-day. 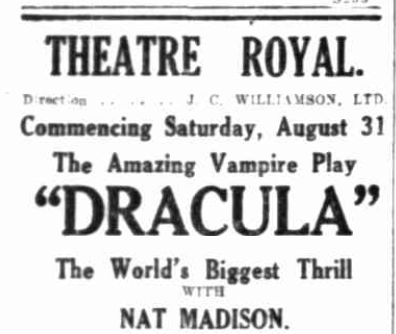 At the Theatre Royal from Saturday, July 20, J.C. Williams Ltd will present the vampire play “Dracula.” The play is described as weird and thrilling. 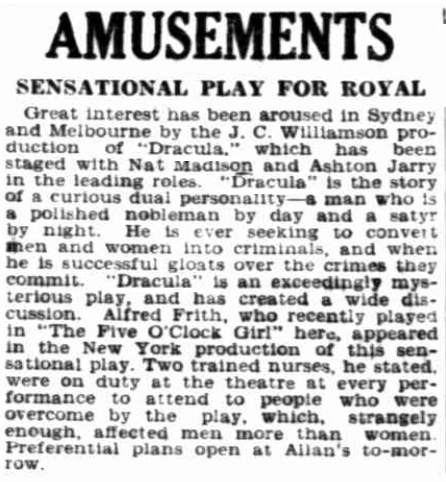 The principle roles will be played by Mr. Nat Madison, Mr. Ashton Jarry, and Miss Bertha Riccardo. 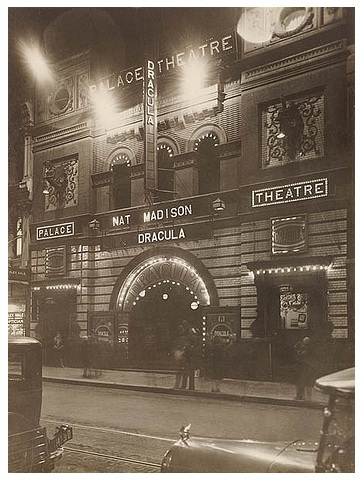 “Dracula,” the stage adaptation of Bram Stoker’s novel, is entering upon its last nights at the Palace Theatre, as the season is to terminate on Thursday, July 18. 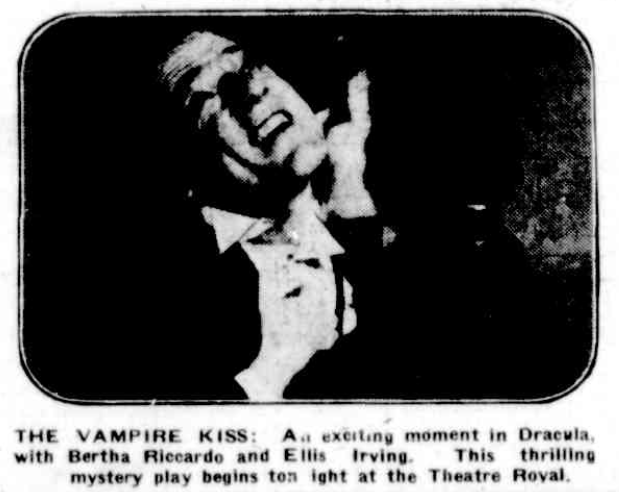 Mr. Ashton Jarry plays the principle role as Count Dracula. 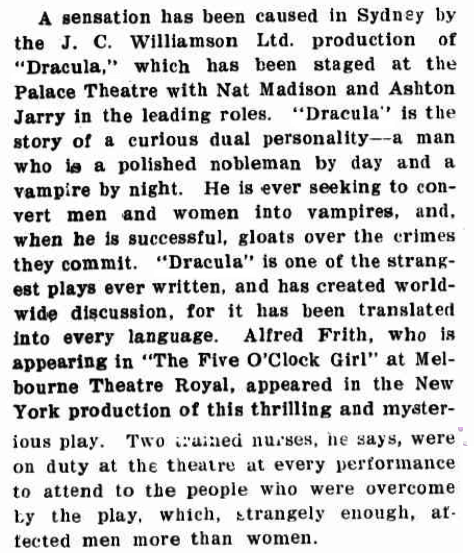 The piece will be repeated at a matinee to-day. 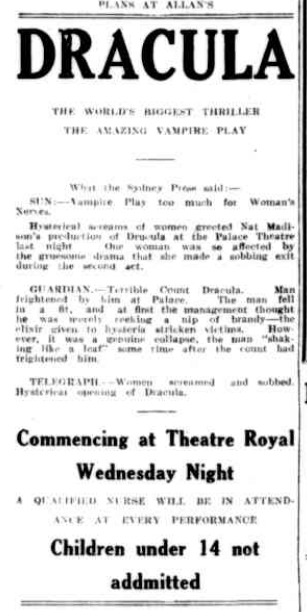 “Dracula,” the vampire play, is to close its Sydney season on Thursday evening. 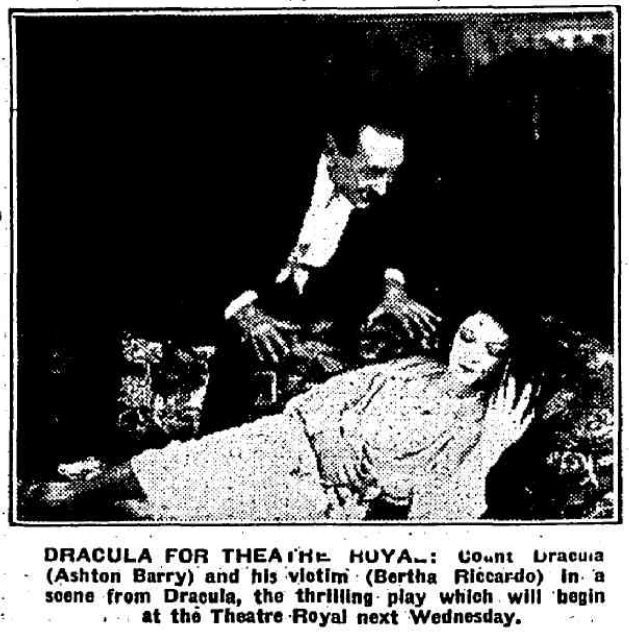 Mr. Ashton Jarry as Count Dracula, Miss Bertha Riccardo as Mina, and Mr. Nat Madison as Renfield, are prominent in the cast. 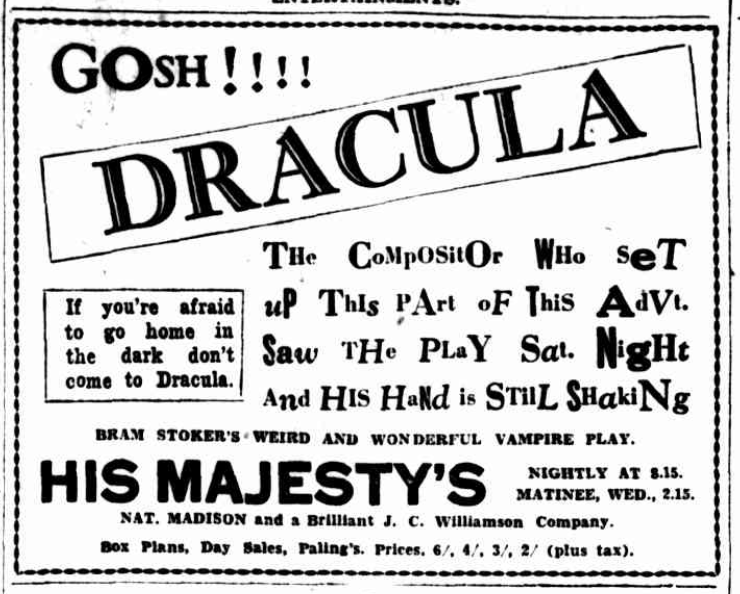 There will be afternoon performances to-day and on Wednesday. 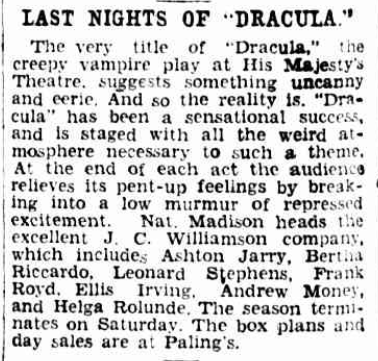 The final performance of “Dracula” at the Palace Theatre will be given this evening. 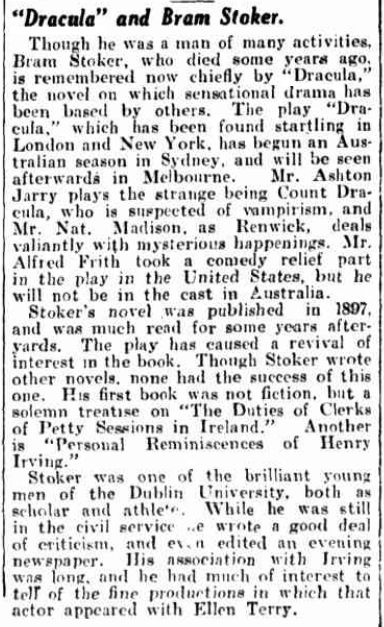 The Melbourne season will begin on Saturday night. 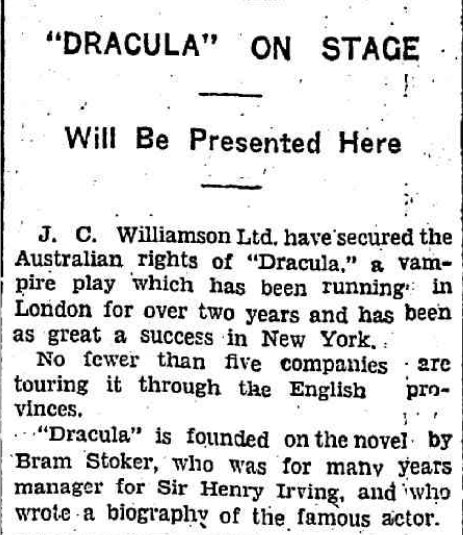 The vampire play, “Dracula,” will be given its first production in Melbourne at the Theatre Royal on Saturday night. 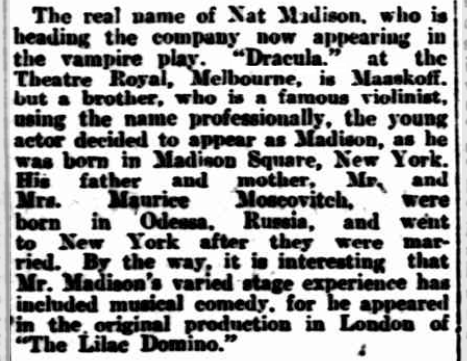 Mr. Nat Madison will appear at the head of a newly organised company. 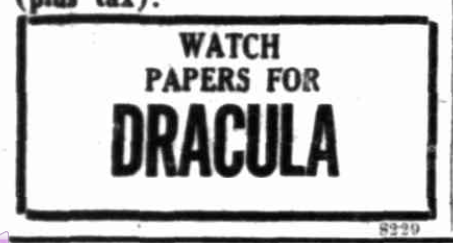 The member s of the “Dracula” company will arrive this morning. 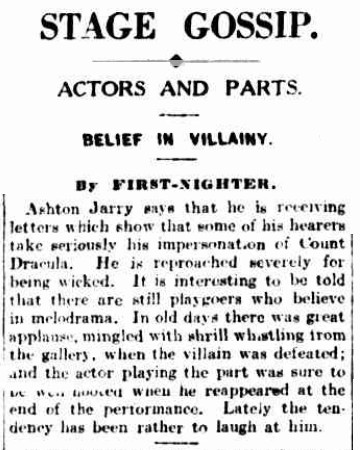 The first production of this mystery play will be given at the Theatre Royal to-night. 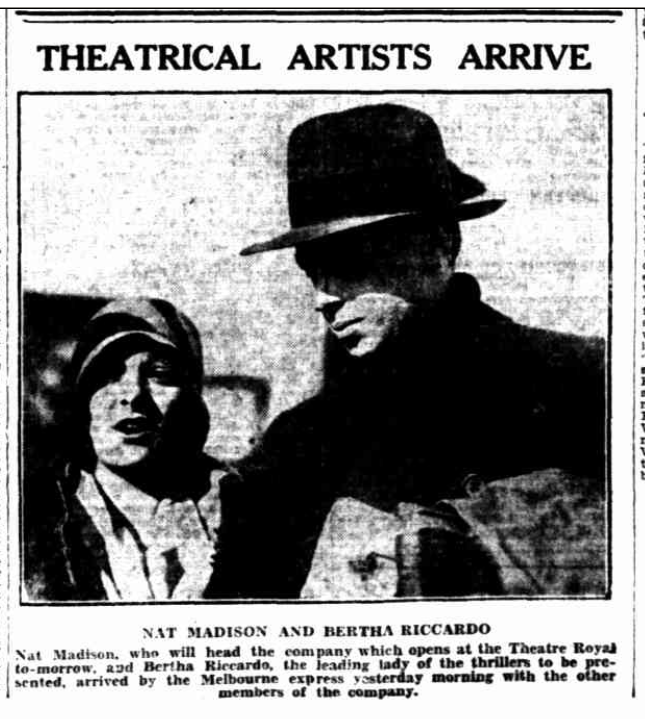 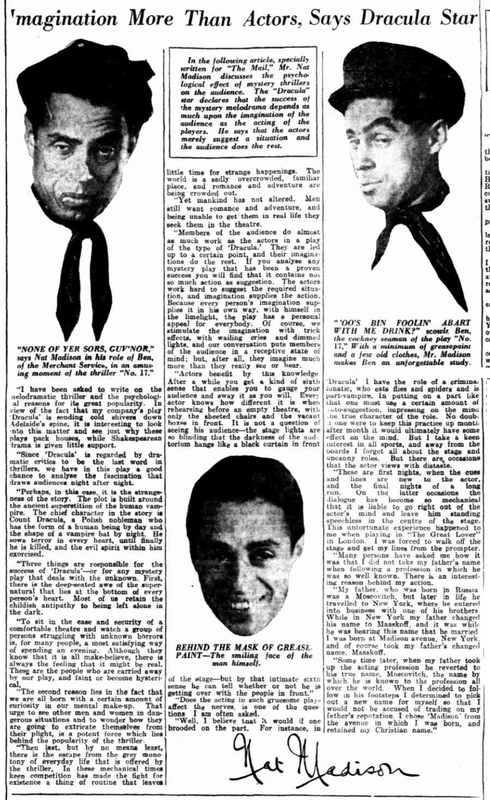 Associated with Mr. Nat Madison will be Ashton Jarry, Bertha Riccodo, Ellis Irving, and other artists. 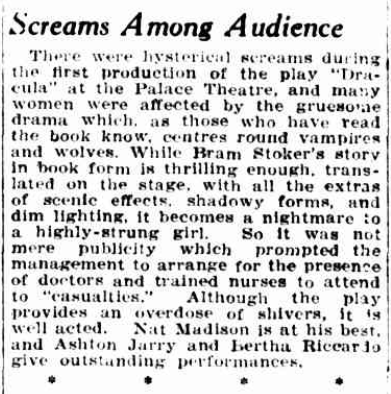 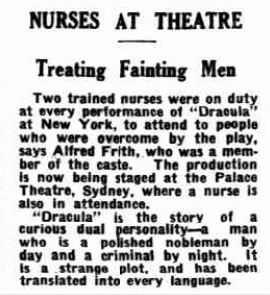 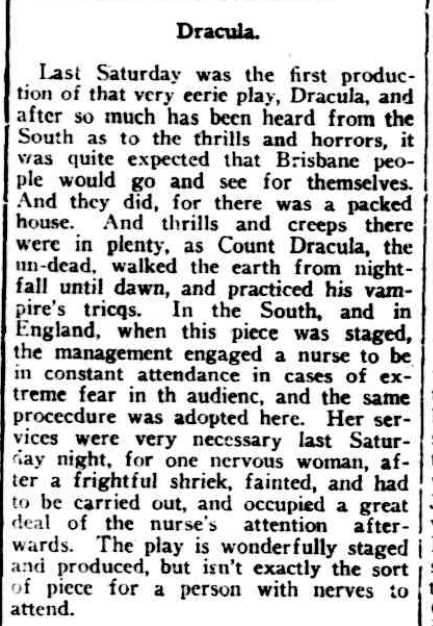 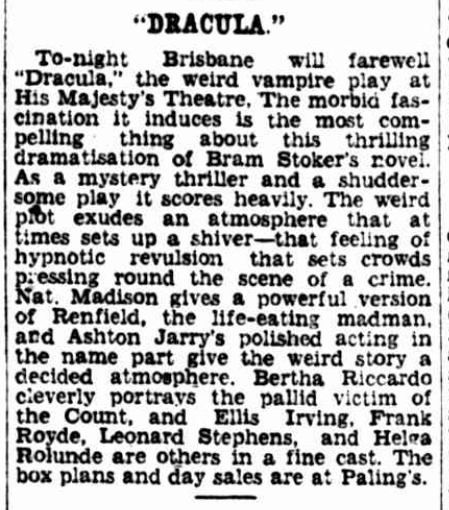 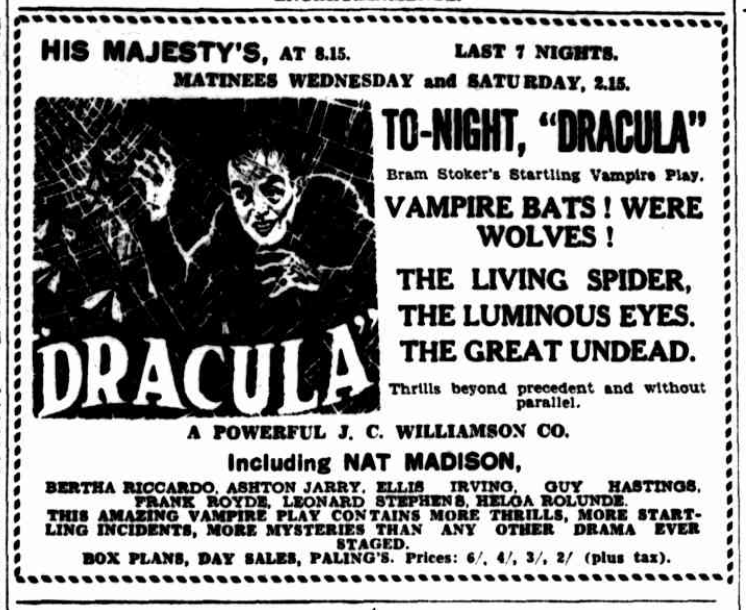 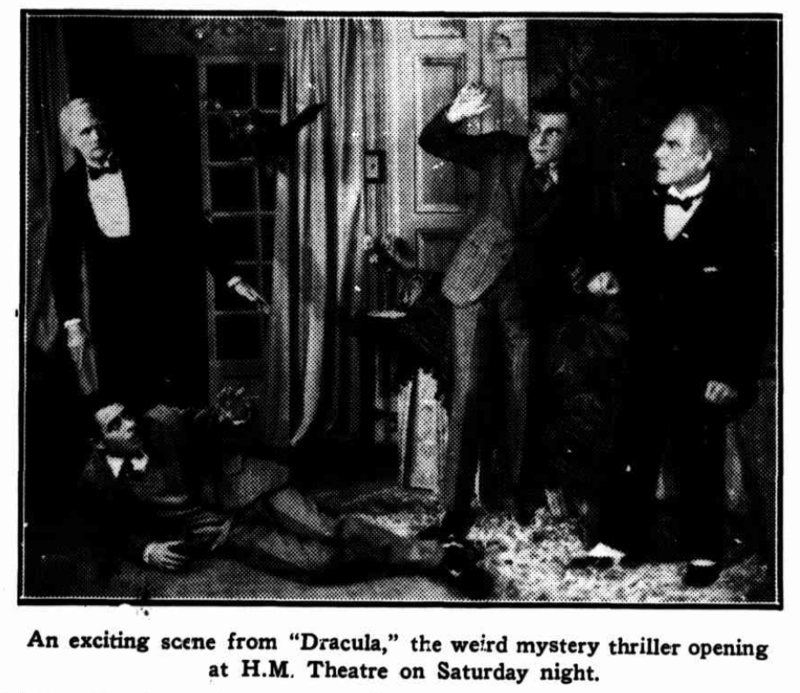 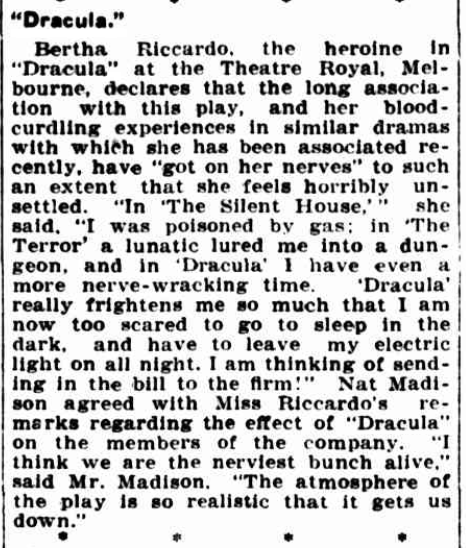 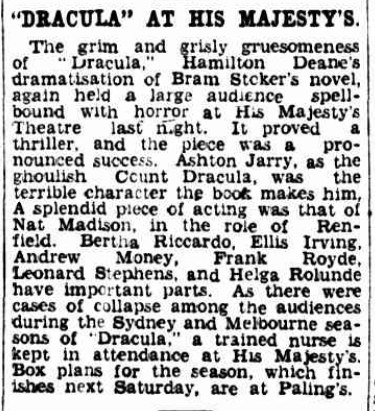 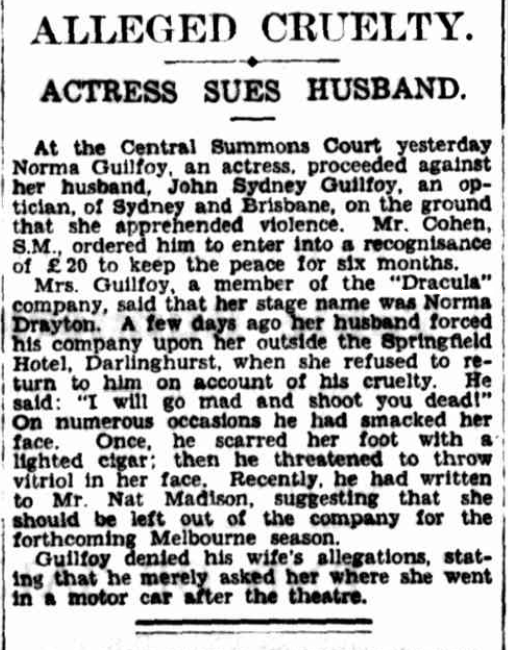 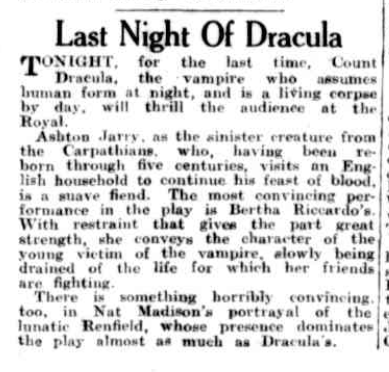 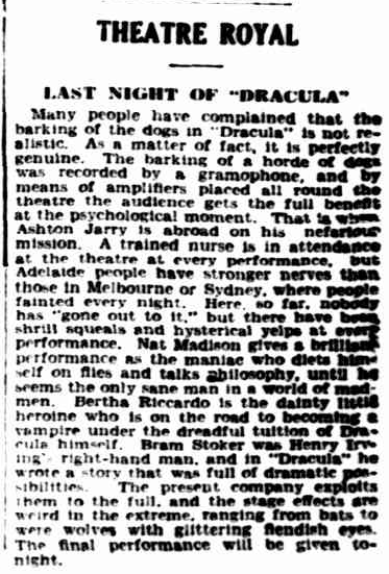 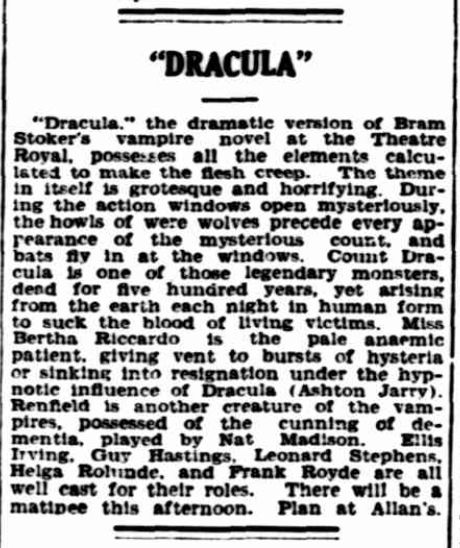 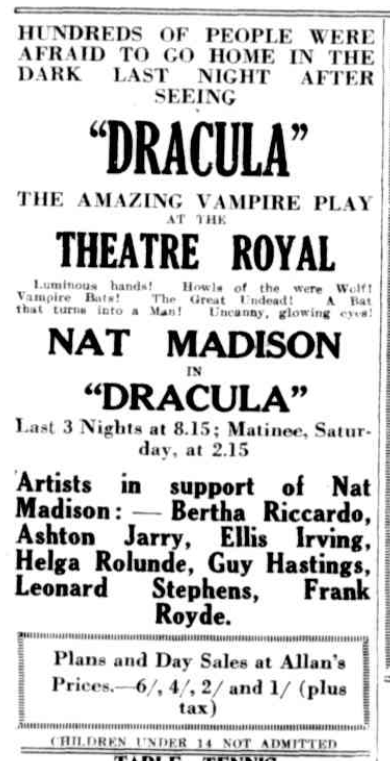 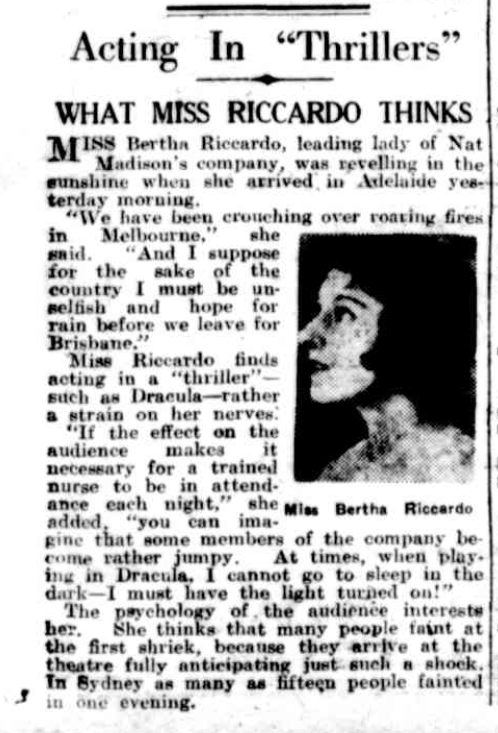 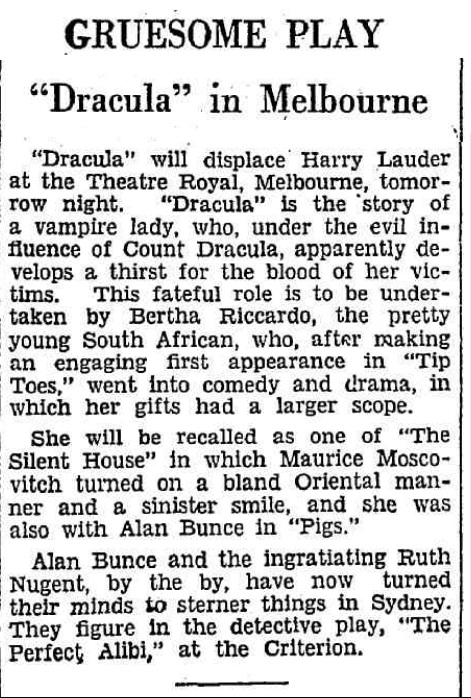 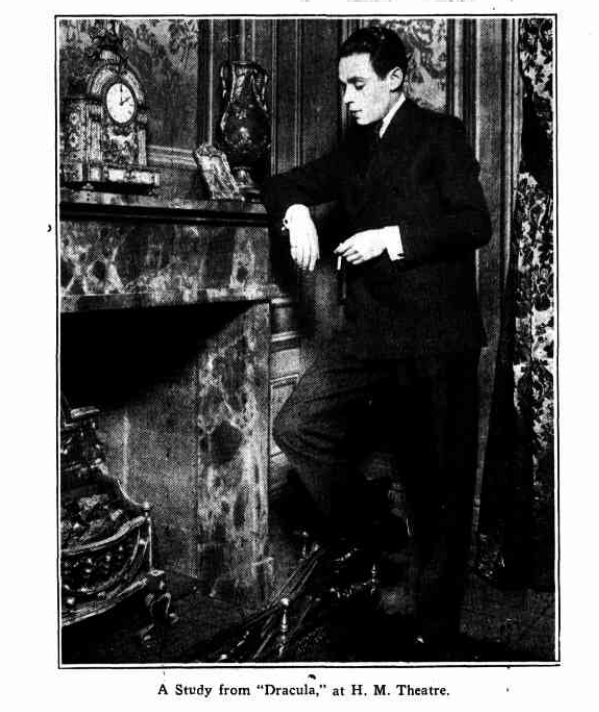 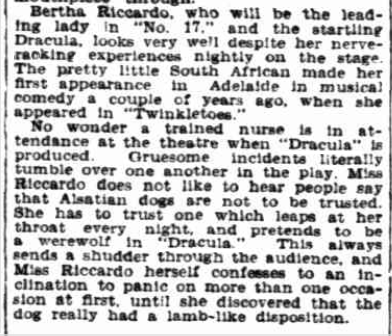 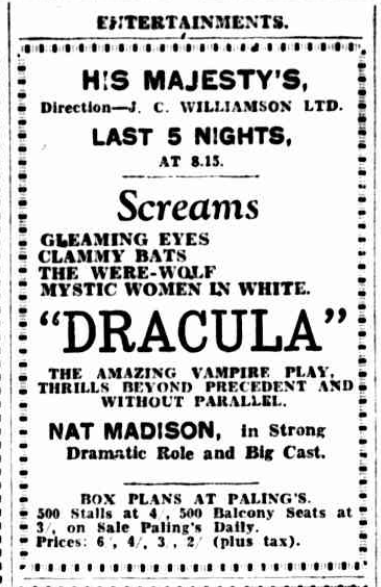 In the vampire play “Dracula,” at the Theatre Royal, strange episodes are acted by Mr. Nat Madison, Mr. Ashton Jarry, Miss Bertha Riccardo, and others. 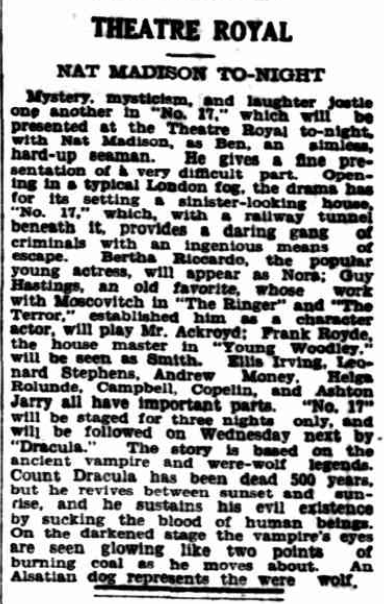 Several changes of theatres are announced by J.C. Williams Ltd. “Journey’s End” will open on Saturday night at the Theatre Royal instead of the Comedy Theatre. 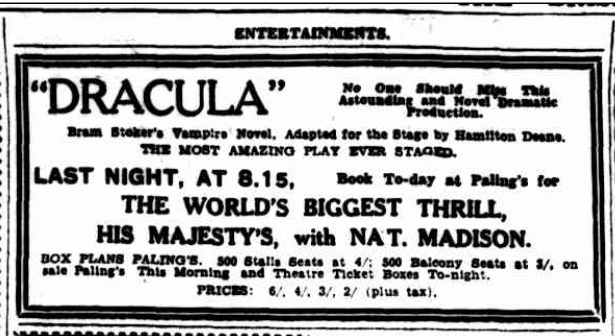 “Dracula” will transfer to the King’s Theatre, beginning at the matinee on Saturday afternoon. 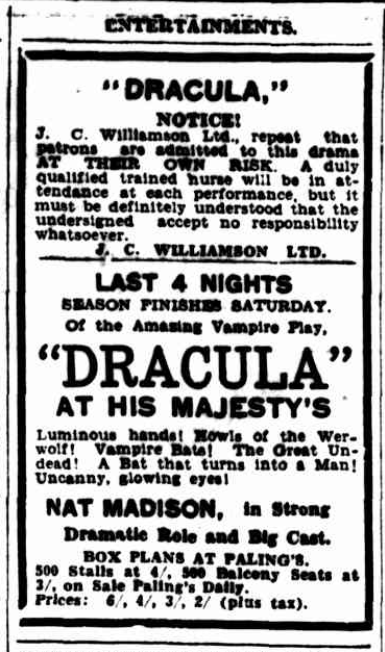 The season of Mr. William Anderson’s company at the King’s Theatre will end tomorrow night. 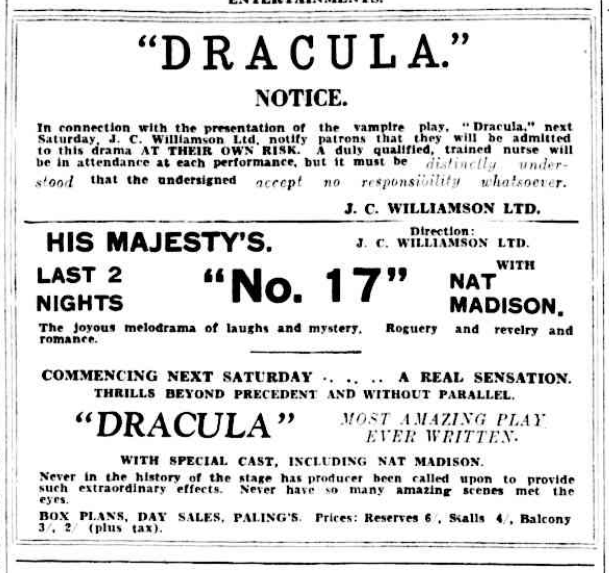 “Dracula” will be transferred to this theatre from the Theatre Royal to-morrow night, instead of on Saturday afternoon, as previously announced. 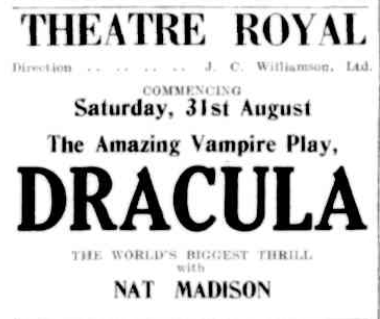 The mystery play “Dracula” was transferred yesterday from the Theatre Royal to the King’s so that the war play “Journey’s End” could begin its season at the Royal on Saturday night.